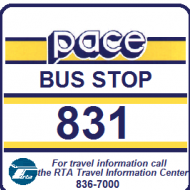 CTA has published the new schedules for March 31 2019. Pretty light on changes, mostly school trip modifications. Route 47: All Archer/Cicero trips extended to Midway. Midway service frequency improved on Sunday to 15-30 minutes. Route 62: Saturday trips that start and end at Archer/Cicero will now start and end at Pulaski Orange Line. Route 111A: Discussed elsewhere on the board - extension of the 111A route to the garage and transfer point at 103rd/Stony Island. • Route 47: All Archer/Cicero trips extended to Midway. Midway service frequency improved on Sunday to 15-30 minutes. Well, I always figured it just be simpler to have buses for this route to just end all its westbound trips at the airport since it’s normal terminus point is about a mile away from it. Funny that we were just discussing why the 47 does this late-nights only. Wonder what bay it'll serve. Why does the 62 have those saturday only trips in the first place, but not on Sunday? It was originally evening and OWL service that was extended when the Orange line opened. When the OWL service ended the evening (and early morning) Midway journeys were retained. This provided service on part of Archer that was covered by 62H at other times M-S.
From 11/7/93 diverted via Kedzie to serve Kedzie/49th L station and extended late evenings and Owl to Midway station via 47th, Cicero & 59th. From 12/4/94 all Su eve services extended to Midway. Owl service w 4/26/98, Midway services retained early morning and evenings. Looks like the off street terminal at Cicero/Archer is being redeveloped? These changes are kind of weird. Maybe counter productive. I dont understand why. The 47 serves kedzie orange so what is the point in sending it to midway? I can only think to link up with the SW side service but cicero 54b is a through route so it basically does the same thing. That only leaves west 63rd and pace connections but again it's faster to take the orange line. Even stranger is the #62 cicero trips to pulaski instead of cicero. You know if I didnt know better sounds like someone wants to sell the archer cicero turnaround lot. Why else those two routes? I always thought the cicero to pulaski corridor on archer was strong. Plus you are losing a main corridor feeder to pulaski orange line. Where will the 62 berth at pulaski. Will the n and s bays be one bay. That will be crowded especially now that they lost half the service. I would definitely consider now running the 62h to pulaski orange. This way you can still feed pulaski orange without losing a bus. There is one positive though the service might improve cause you wont get trained at archer Knox. That intersection is painful. The 111a I dont know alot about but around 103rd stony is all industrial so what are they serving. Are they having issues with reliefs? Busfan is under the impression that the Cicero/Archer terminal is no longer available and could be redeveloped; therefore the 47 and 62 Cicero trips need new terminals. Expanding on your idea Bushunter, I would like to see the 62H run more frequently (maybe every 15-20 mins) and on Sunday, replacing the 62 west of Pulaski. Hopefully this would improve the reliability of the 62 line. 62H riders to Midway could change to the 47/54B at Cicero. The 62 will still have thru trips to Harlem. But the shorter trips now dont havr to contend with the RR crossing near Archer_Kilpatrick which currently can kill all trips. I suppose the the 47 extension as well as the short turn 62s could be related to a possible sale of the Cocero/Archer turnaround. No need to increase 62H service with the 55N within shooting distance. I understand. But you could still have the problem I mentioned earlier concerning the RR crossing at Archer/Kilpatrick. Those freight trains will wreck havoc. That's why the 62h goes to midway but its counter productive you go south when you want to go north most passengers are transferring to orange. Why cant they just do the cicero to 47th bypass there is a bridge there. That would solve the problem. For the time you wait for freight trains to pass you are losing the time to go south then north. If you canned the #62 west of pulaski which would be an interesting proposal as most riders are coming off the orange line anyway beef up the 62h that may not be a bad idea. You can also maintain schedule better on the east end where its needed. There are 3 berths at Pulaski Orange & as you noted, the 62 has two of them. I can't imagine it'll get that crowded on Saturday that there'll be buses without space. On the 147 change, it seems CTA has determined the bulk of the high ridership on the route from downtown in the PM rush is north of Randolph which jibes with my observations during those times I've ridden the 147 in PM rush times. A lot of those State Street riders are getting on the 146 and 148 from what I usually see. The 147 picks up a lot more when it's on Michigan Avenue. So that 2 to 3 minute headway in PM rush on the NB side shown in the schedule is needed more on Michigan Avenue and State Street riders should be able to make due with the 10 minute average headway that will remain for those buses that will still start at Michigan and Congress Plaza. But looking at the current schedule again more closely, it looks like CTA is actually correcting typographical errors and putting the R back next to the Randolph beginning trips that should be there but aren't, unless one wants to believe an artic on the route has actually been equipped with warp drive and starting at Michigan and Congress at 4:20 PM and making it to Michigan/South Water at 4:22 PM for example. Did I miss something? When I was doing my write up of the changes, the the trips starting at Devon are still the same since the last schedule change. Only thing that changed in regards to that was 3 additional morning trips that start at Howard instead of Devon. Side note: I've never seen a NB headsign that hasn't said Howard Red Line, how long have trips been ending at Loyola? Clarification on Cicero/Archer - terminal is no longer going to be used. All weekday and Sunday 62 service goes to Harlem. Only short turns (to Pulaski Orange) are on Saturday. Anything shown as to or from Cicero is a pullout or pullin. The big reason I suspect is that making a left turn out of that terminal across six lanes of traffic on a VERY busy street was becoming unacceptably dangerous. BRC crossing at Kenton is probably less of an issue than 10 years ago, as while train volume has not appreciably fallen, the average speed does appear to have increased so the blockades are of shorter duration. The reason 55A, 55N, 62H go to Midway have very little top do with railroad, as the 55A and 55N (and 62H until it was sent to 63/Archer) cross the same BRC line twice further out so they see the same train anyway. It has to do with 1990's political interference by Lipinski. Originally the plan was for 62A, 62N, 62H to be only service west of Pulaski Orange during weekday and Saturday daytime, with 62 running to Harlem Sundays, evening and at night only, otherwise ending at Pulaski. Lipinski said no, so 62's continued running to Harlem at all times. Then Lipinski said his constituents did not like waiting for trains at Pulaski to go east, and would rather get on at the end of the line at Midway, and it was so. Lipinski also forced the continuation of expressway service (for no real reason) for several years. That was a very sad period for CTA when decisions were made at city hall with no input from CTA, which was forced to implement them. Lipinski Jr seems to leave CTA pretty much alone. He has bigger fish to fry than mess with bus schedules. New bus bay configuration at Midway to accomodate #47. I was going to ask whether that affects River Valley Metro, but I see they already moved their stop out of the terminal.